Getting the right tools for the trade is essential for all artists and craftspeople. You should always buy the best materials that you can afford as the quality shines through in the final artwork. When people see a completed mosaic, hopefully they see a beautiful design, skilled artistry, lots of patience, love and care built into the piece. However, the ‘back room boys’ are also very important – the adhesives and the grouts. 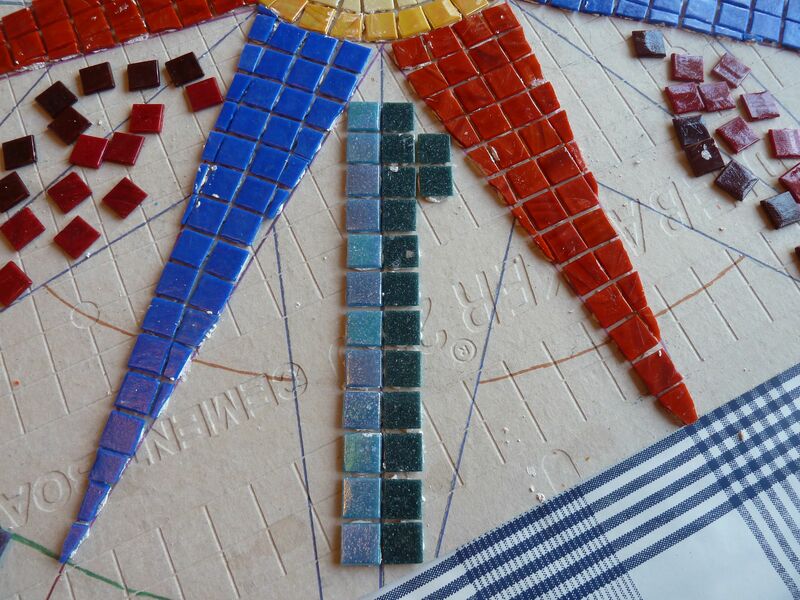 In fact they are literally the cement that binds the piece and if you use poor quality materials, no matter how good the mosaic is, the end result will be poor and may not stand up to the test of time. Fellow BAMM member and mosaic artist Jane Bracey arranged for a small group of us to go on a training day with BAL – Building Adhesives Ltd. Based in Stoke on Trent, they are the market leaders for tiling, delivering innovative products and service solutions for over 50 years. Although their main trade is to tilers and floorers, the mosaic world also form a key part of their business so they were delighted to offer us a day of training in the use of their products. 11 of us arrived to be welcomed by David Rowley who has been with the company for 27 years and was to be our trainer for the day. After a short presentation on their history and key products we were dispatched to Research and Development. Here we were shown how they put together the various components that make up the adhesives and grouts and innovative ideas for future products. This whole area was fascinating and it was great talking to real scientists. Did you know that they can use rubber, sand or glass in adhesives? There are a whole range of varying strengths, flexibility and durability to take into account when selecting your adhesives. We then went to visit Quality Control where it was explained to us how they are able to identify an exact batch of product from a tiny sample using advanced techniques. So although their products are of the highest quality, if there were any problems, they would be able to break down all the component parts in order to resolve the problem. An excellent buffet lunch – with a huge range of cream cakes – was followed by an afternoon of practical, hands-on demonstrations from David. He said it was quite a novelty training us as obviously their key clients are tilers, floorers, etc. By running this course BAL was able to appreciate the obstacles and challenges us mosaic artists have to overcome and how they may be able to specifically adapt various products to meet our unique needs. There are a lot of us out there so we do form a huge potential market for them. As David has been in the business for so long he knew all aspects and was an expert in anything tile related – including grouting. When he wanted to demonstrate various grout techniques I just happened to have my Green Man mosaic which David used as the ‘one I prepared earlier‘. So my Green Man has now been professionally grouted by the Grout Guru. After a factory tour and collecting our Goodie Bags (which included enough grouts and adhesives to mosaic a football pitch) we all made our way home. It was a thoroughly enjoyable day and we all learnt so much. David was happy to answer our numerous questions and queries, some of which even challenged him but he always came up with a solution. Additionally, it was lovely to meet so many other BAMM colleagues. We have all been in touch since and visited each others’ websites and Facebook pages. All our work is so different and seeing their beautiful range of mosaic work emphasised to me yet again how many different styles of mosaics there are and how there is room for us all in this exciting art world. October is a great month. Although chilly early morning and evening, the days are usually lovely and bright with a hazy autumnal sunshine. I have seen some spectacular sun rises as I do my early morning walks. The trees are turning beautiful colours and its lovely to be out walking in the crisp air kicking leaves. Its also a great excuse for me to start making lovely autumn casseroles to come home to tuck into after a days activities. This has been a busy month for me mosaic wise, having started it off with an excellent and inspiring BAMM AGM and Conference. 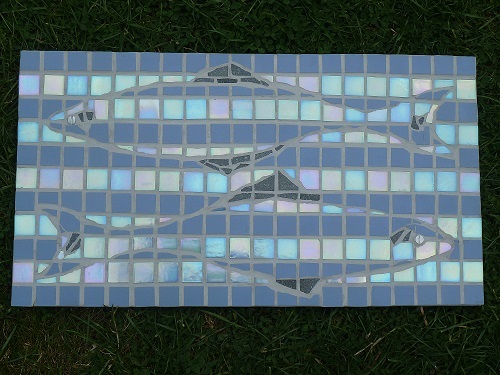 Following on from the workshop I did with Jane Visick, I have been experimenting a lot with glass-on-glass mosaics. This is the one I started at the course with Jane and finished at home. Although I know it is a very basic version of what Jane was trying to teach us, it has given me a good start and has enabled me to grasp the basics of cutting and shaping the glass. It seems to be a very, very messy process and no matter how neat you try to be, you get tiny shards of glass everywhere so I am forever tidying up after myself. The ‘rule’ of never going into my studio barefoot is even more relevant with glass bits hiding everywhere. I really enjoy making these glass pieces, I love the long ‘slashes’ of glass and the dramatic effect they create. I will now need to perfect cutting the smaller pieces and shapes to make up the pictures. Whilst at the BAMM Conference I got some great news – the new Tower House Gallery in Northumberland has taken 6 pieces of my work to display. I am absolutely delighted as it is a lovely gallery and the quality of work on display is very high indeed. I will be proud to have my work hanging alongside the other artists. I aim to make them a range of glass-on-glass pieces and I will also be making another new range of tile and glass mosaic on slate, similar to this triptych. So its going to be a busy autumn for me with 2 new ranges waiting to be made. We also aim to do the last leg of the Capital Ring next week, which will just about be within a year of starting it! Things have been really busy in my mosaicing life and there are lots of exciting activities going on. I was delighted to receive a commission from a new client. It is for a large outdoor piece to go into a recess in the wall of their lovely courtyard garden. Pictures of the space and garden were sent and telephone conversations have taken place. Its been great discussing ideas and colour schemes and over the course of several calls and emails, we have found we are very similar and are kindred spirits. I do love having commissions although they are quite stressful as well. In effect you have to get inside the clients mind to visualise what they want. Some people are very clear and precise, while others leave it totally up to you. This client had a few initial ideas that we discussed and I sketched up. They have developed and evolved and now we have a design agreed that we are all happy with and will suit the space and environment perfectly. It is quite a geometric design and will have bold, strong colours. 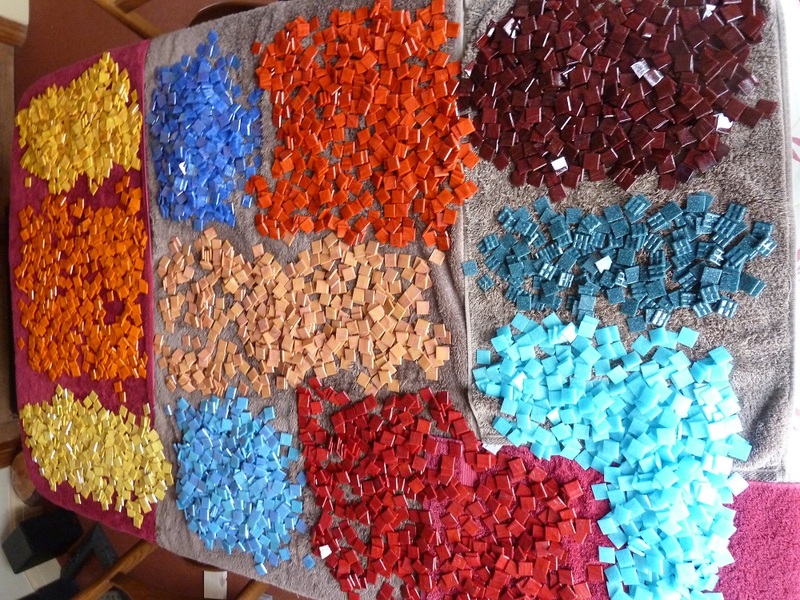 I will use a range of glass tesserae along with quite a few iridescent tiles. I will be keeping a picture diary so the client can see all the different stages and processes involved. I can’t wait to start! The client found me through the BAMM website. 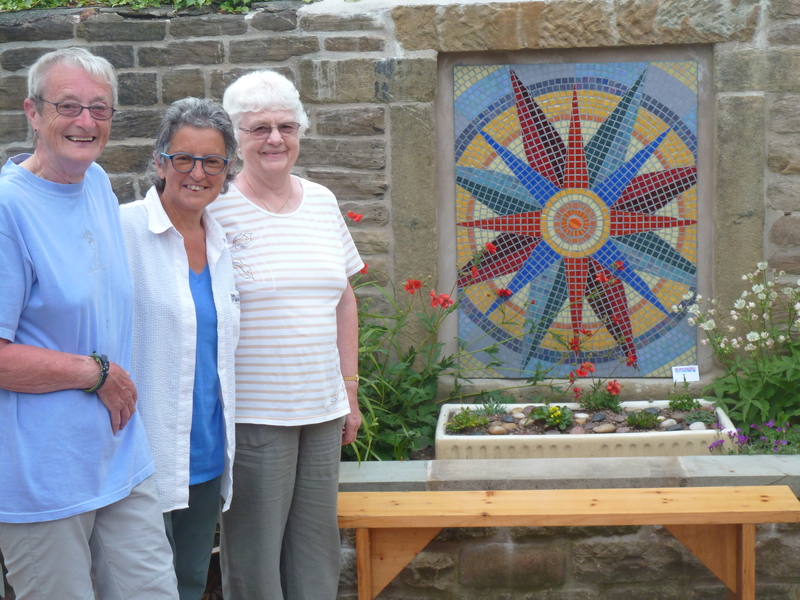 BAMM is the representative body for mosaic makers and although I felt I ought to join them, I didn’t feel I was ready to until I went to their AGM late last year and signed up on the day. Funnily enough with Christmas and being unwell, I had not had a chance to get my profile onto the BAMM site until this February – about a week before my client starting looking for a mosaic artist! Timing is everything. I have now got my profile on BAMM well underway and have put up my mosaic CV. I am amazed at how much I have done. Please do go and have a look. I am shown under ‘Artists’ as Henderson, Rosanna. THE REQUEST: If you are interested in commissioning apiece of mosaic art (indoors or outside, large or small) please do give me a call and we can have an initial chat. All pictures on this blog are commissioned pieces.